In an special to SI.com, Rafael Nadal and Toni Nadal discuss his disappointing season, goals for 2016, academy opening in May in Manacor and why clay season will be critical. 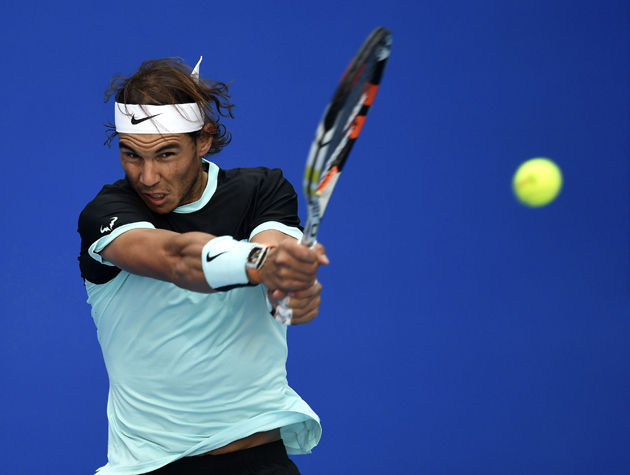 BEIJING – Rafael Nadal has made headlines in 2015, but not for the usual reasons. The 14-time Grand Slam champion failed to win a major title for the first time in 10 years and did not reach beyond the quarterfinals at a Slam this year. But the Spaniard and his camp have reason to believe next year will yield better results, despite the negativity surrounding his 2015 season. Mailbag: Are Nadal's recent remarks, commercial decisions worrisome? ​Nadal’s fans, competitors and coaches have seen him in every state of mind this season: hopeful, frustrated, dejected, upset. “I am No. 8 in the world. I am not No. 100. Seems like I am No. 200 in every press conference,” Nadal said after a second round match at the U.S. Open, when asked if he understood why his fans were worried about his recent form. But now, as Nadal is into his first hard court semifinal match of the year at the China Open, he seems very calm about place in the game and is actively preparing for the 2016 season. The former World No. 1 has the same mindset as his longtime mentor: hard work will soon pay off. Rafael says practices are improving and the final hurdle is to make things click again during matches. But he’s not surprised at how long it’s taken. The question is: what point in his career is there? Is it his 2013 level of play, where he won the French and U.S. Opens, and eight ATP titles? Or is it simply making his game evolve again, or reconnecting his rivalry with Novak Djokovic? “A bit of both,” said Toni about Rafael's season two years ago and the development of his game. About the possibility of catching up with Djokovic, Toni is less optimistic. Rafael hasn’t won a Masters title in the fall since 2005 and his last major title came in 2014 at the French Open. But even World No. 1 Djokovic spoke about the Spainard's chances at a title before this year’s U.S. Open. “He always has a chance. You can’t sign Nadal out, 14-time Grand Slam champion, he deserves [to be] a favorite,” he said. After several tough losses and disappointments, Rafael's motivation is still intact for the end of this season and for his ambitions for 2016. “My goal is to recover the level especially to play my best on clay next year,” he said. And for this, there’s a clear plan set up for the months to come. Toni and Rafael have already changed some things at practice and assessed his game for areas of improvement. “In 2013 his level was higher because his game was stronger. He was taking the ball more forward, he was going for his shots and for the points. This season, the legs have stopped a bit,” Toni said. “But when you are tighter, then the legs don’t move that well anymore. We need to do better and I think we know how. Toni and Rafael will open an academy in Manacor, Spain, next May, marking the pair’s largest project outside of Rafael’s career and one that’s been in their minds and hearts for years. The academy will not only help kids develop their tennis skills and values, but will also serve as a school, giving students an opportunity to attend an American university. “We’re going to work hard to try to help them to have a good future, hopefully in tennis, but if not, to prepare them for the life,” Rafael said. “We feel we were prepared for this project because of all the experience we have on the Tour for sure but also on life. I’ve seen the transformation of this little boy to the No. 1 player in the world. I’ve seen every step of the way,” Toni said of his nephew. Whether it’s his outlook, adjustments to form or the symbolic meaning of academy, Rafael and his camp both believe there are signs indicating better results for 2016.